For as long as I’ve been around, Ray Bradbury has been there as an esteemed literary elder. Even back in the Seventies, a time when American society was especially divided and polarized, Bradbury was a transcendent grandfather figure, respected by all, disliked by none. Ray Bradbury, visionary of the Atomic and Space Ages. 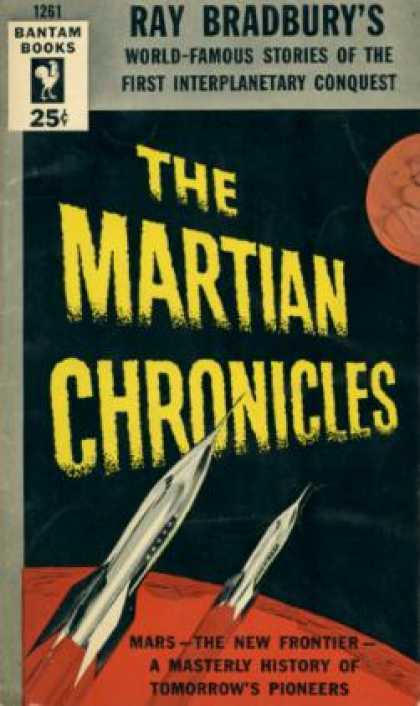 Bradbury was an author of novels, but he also penned scripts. He was an oracle of television when television was becoming the premiere medium of our time. Like his contemporary, Rod Serling, Bradbury was a man from TV’s black and white era, when the best writers on the small screen worked behind a veneer of strict, straight-edged respectability, long before Archie Bunker’s toilet flush set the new standard for TV excellence. Unlike Rod Serling, he was neither edgy nor beatnik, and he didn’t die young. Ray Bradbury passed away in the city where he spent the last 77 of his 91 years, Los Angeles, California. Bradbury would appear to be an atypical Angeleno by our contemporary estimation, but in fact he represents a classical L.A. archetype: the Midwestern Angeleno. 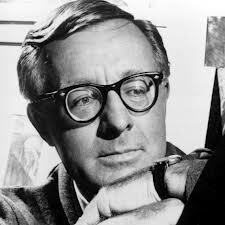 As a boy of 14, Bradbury moved from Waukegan, Illinois to Los Angeles with his family at the tail end of L.A.’s initial boomtown era–a period of four decades that saw the city’s total population soar from 33rd in the nation in 1890 to 5th by 1930. What made this growth unique from the other major American cities whose populations swelled in those decades was that it was fueled largely by WASPy Midwesterners, rather than European immigrants. People like the Bradburys came from places like Iowa and Illinois and settled in areas like South Central L.A. and Inglewood. Ray Bradbury graduated from Los Angeles High School in 1939 but said his real education came from hours spent reading and writing at the L.A. Central Library. Unable to afford college, Bradbury worked selling newspapers on a corner of Olympic Blvd as he peddled his stories to movie studios and literary publishers. 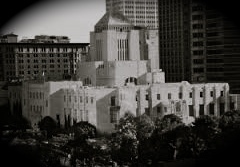 Central Library, downtown Los Angeles. Incredibly (for a resident of Los Angeles), Ray Bradbury never learned to drive. It surprises people to learn that the man who penned such unmistakably Midwestern flavored Americana spent his entire career in Los Angeles, but Bradbury clearly retained enough youthful memories of Illinois to populate his prolific body of work. Indeed, perhaps leaving Illinois at such an innocent age is what allowed Bradbury to preserve such an idyllic Midwestern childhood from which to draw. Ray Bradbury and his wife lived and raised four daughters in a relatively modest home in the quietly elegant neighborhood of Cheviot Hills, precisely the kind of place where you would expect a writer to reside. It’s a nice area for leisurely strolls, but being L.A., Cheviot Hills is surrounded on its flanks by freeways and major thoroughfares. It’s not an area with lots of walkable destinations, but it is an ideal place to contrast a cozy family home life with an endlessly encroaching dystopia. Ray Bradbury might be more quintessentially Los Angeles than we think.